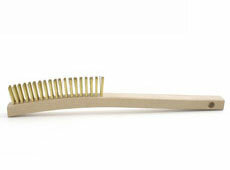 Brush Research Manufacturing provides an assortment of scratch brushes for a variety of applications. 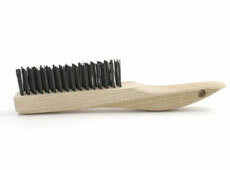 Our offering of scratch brushes includes curved and shoe handle scratch brushes, block brushes, chip removal brushes and more. 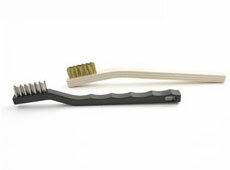 These brushes are well suited for applications such as plating process brushing and fine metal finishing work. 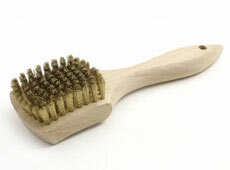 To learn more about our scratch brushes or to order yours, contact a distributor. 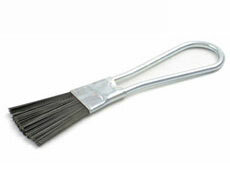 B-40 3 x 19 1" 13 3/4" 1 3/16"
B-41 4 x 19 1 1/8" 13 3/4" 1 3/16"
B-47 w/scraper 4 x 19 1 1/8" 14" 1 3/16"
B-25 3 x 10 7/8" 12" 1 3/16"
B-740 3 x 19 1" 13 3/4" 1 3/16"
B-741 4 x 19 1 1/8" 13 3/4" 1 3/16"
B-840 3 x 19 1" 13 3/4" 1 3/16"
BN-49 4 x 19 1 1/8" 13 3/4" 1"
BT-49 4 x 18 1 1/8" 13 3/4" 1"
B-688 1 x 16 3/8" 10 " 3/4"
B-44 4 x 16 1 1/8" 10 1/4" 1 3/16"
B-52 2 x 17 1/2" 10 " 1 1/4"
B-744 4 x 16 1 1/8" 10 1/4" 1 3/16"
B-844 4 x 16 1 1/8" 10 1/4" 1 3/16"
B-210 4 x 11 1 1/8" 3 1/4" 9/16"
B-767 HH Border 10 x16 2 1/2" 4 1/4" 3/4"
B-61 9 x 10 2 5/8" 8 7/8" 5/8"
B-200 1 1/4" 5 1/2" 1 1/2"